So, in this post we showcase a bunch of photo WordPress themes perfect for anyone who works in the photography field. 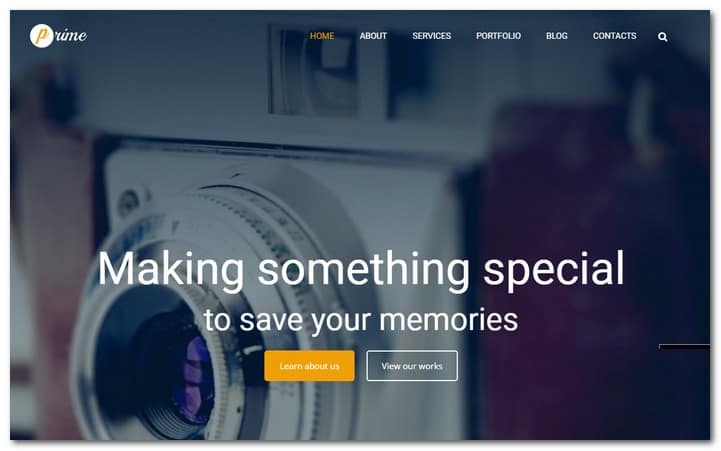 Whether you are a photographer and looking for something to help you make your online portfolio or own a photography studio and want to put up a website to help advance your business, these premium ready-made templates will help you do just that. Artists have creative mindsets, unique world outlooks, special tastes and preferences. It is an interesting job to create a website that will meet the requirements in this area. You will need flexibility and good customization options. That’s why most people decide to use premium WordPress theme for this purpose. Why purchase premium templates? First of all, you don’t buy a pig in a poke, like you do with custom designs. You see how your website will look and perform even before paying any money. As to the price of a premium template. It’s much lower than the price of custom design. A premium template is a smart investment that will help you launch your website quickly and quite simply. All the technical stuff is done by professionals. All you have to do is install the theme and use it on your resource. The themes are easily customizable too, so you will be able to create and maintain the website of your dream in no time. Another useful feature of premium templates is full access to support. If you encounter any problems during installation or at any other point of working with the template you can contact the support crew and they will surely help you out as quickly as possible. Most premium themes are provided with extensive documentation as well. Please keep in mind that not all web design companies provide free lifetime support. You’d better get to know this before you make a purchase. The problem is that paid or limited time support puts certain limitations on you. Some people buy templates because their price is reduced at the moment, or they have a promo code that is valid, say, for a month, or maybe they win a template in the giveaway. In a word, sometimes a person just doesn’t plan to use the template straight away. They come back to it later, when support term has already expired, which can become a serious disappointment. Did we mention most of the templates in this compilation are made with WordPress and provided by TemplateMonster and Themeforest? 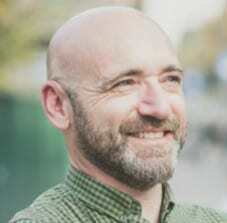 If you don’t know what WordPress is, it’s a great open-source CMS that is constantly evolving. There are thousands of user-made plug-ins and widgets that further enhance the functionality of this already fine tool. It’s easy to use and lets you start up a project in a very short time. WordPress powers millions of websites all over the world. It is the most popular platform for today. Most of the WordPress extensions are free to use, which is also great as you save your money still having the opportunity to boost your resource. WordPress has a vast community, which is always ready to help and support you with any questions you might have. The fact that photo WordPress themes were developed and provided by TemplateMonster and Themeforest’s professionals is also beneficial. These company are among the industry leaders with many years of experience. They track all latest web design trends and web development technologies and then apply the innovations in their production to provide you with the advanced and qualitative items. If you’re interested in some tutorials on how to customize and work with the templates, here’s a couple links to some interesting resources. TemplateMonster WordPress Video Tutorials – this link is recommended for those who prefer to absorb the information in video format. The simple steps to take to set up your own WordPress website – this is a website containing guides following which you will have your WordPress website up and running in the nearest future. 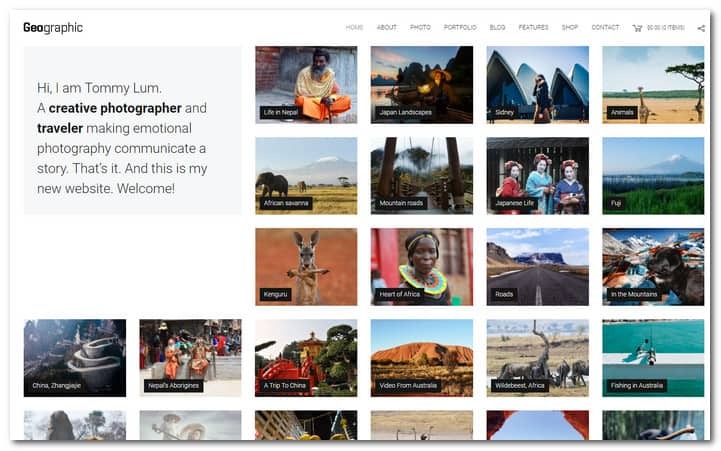 Nature Photographer Portfolio Responsive WordPress theme is a fully customizable and stylish design that comes with a flexible responsive layout as well as retina ready layout. These, on top of the stunning design that is incorporated with the theme. The theme is made to be ideally suited for creatives to represent their unique works. A number of features incorporated with the theme provides more options for building a fully functional photographer site. In addition, the theme also comes with premade templates that are perfect for fulfilling the unique tastes of your target audience. This theme is the ideal choice for a unique photographer, artist or designer portfolio. It is also good for blogging. The theme comes with a geographic slider, which supports both images and videos. With this slider, you can create a more attractive artwork presentation. It has albums, flow and grid, which is the best way of remembering special events as compared to using albums. With this feature, you can create as many albums as you like easily. In addition, there is also a gallery and portrait ribbon. It is an easy and simple way of sliding your professional artwork. You just need to drop images into the slider and watch everything with satisfaction. True North will allow you to showcase your thoughts and work online in the most elegant manner. It has been designed as a portfolio theme with a really unique layout. 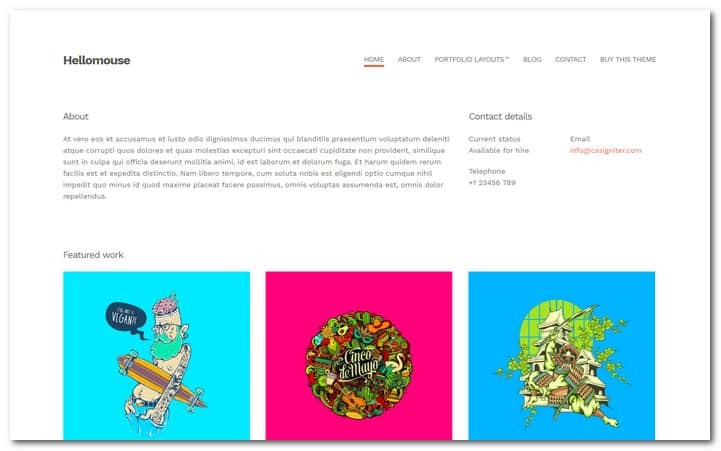 With its portfolio content type, you will be able to put your work in the limelight. Portfolio items take up the whole homepage, helping you put your creativity in focus in the best manner possible. This theme comes with flexible layout option for customizing your design. It has column listing, isotope filtering and portfolio display that includes image array and slideshow. 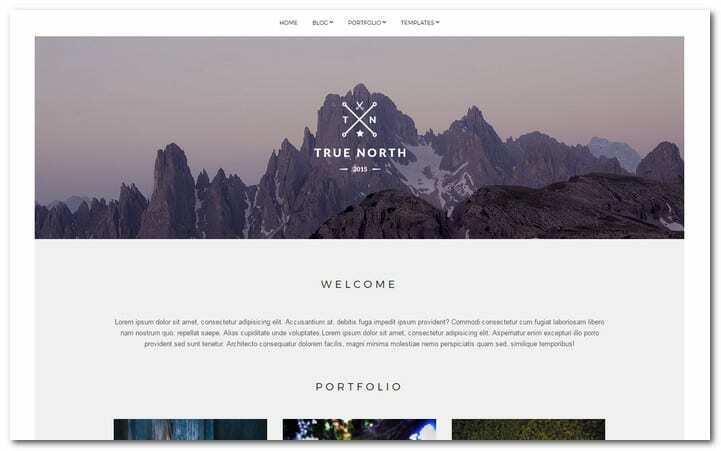 True North also comes with robust options to provide total control over your site. You can upload your own logo, customize backgrounds and turn elements on and off. The theme has been optimized for SEO to give your website better search engine ranking. It is also incorporated with custom widgets that provide more functionality. Know the theme more by clicking on the product link above. Director of Photography WordPress Template is made to overhaul or create an online blog or portfolio. The template is boosted with Bootstrap options. It is compatible with modern browsers and comes with a fully responsive design. Thus, your website will display perfectly on a wide range of screen resolutions and mobile devices. Your website can also be viewed in every modern web browser in existence today. 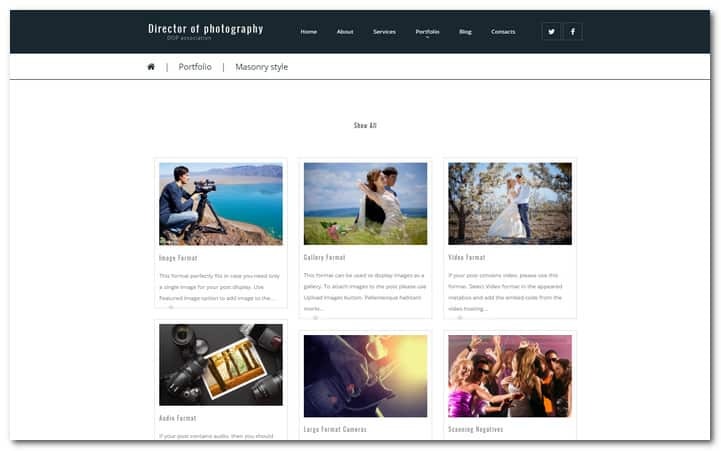 Director of Photography WordPress Template is based on the Cherry 4.0 Framework. It has a range of features that makes it unique among website designs. There is also a wide collection of slider plugins that are available at your disposal. You can create content in professional looking slides and enhance them with transition effects through Cherry Simple Slider or Premium MotoPress Slider. To make it easier for you to edit, the MotoPress Editor was added into the template. MotoPress Editor comes with drag and drop feature. This theme is a personal, portfolio and photography website template that is minimalist in design and packed with the most modern, WordPress features. It features 3 unique styles for the homepage, a full screen slideshow for image gallery and extensive galleries admin. Core can accommodate multiple image upload. The theme features 3 homepage styles, full screen slideshow for photo gallery, support for Google Web Fonts, 4 portfolio styles, multiple images upload support, extensive galleries admin, popular posts, 8 custom widgets, recent posts, Twitter feed, contact form, social media icon, Vimeo support, lots of shortcodes, flexible page columns, styled typography, Flickr photostream, portfolio custom post type, WordPress custom menu, Timthumb, comments and single post for blog page, unlimited sidebar, contact us page, valid HTML, jQuery effects and many more. Check out the demo page to see this theme for real. Addison is a modern theme for WordPress that is created with creative photographer portfolios in mind. It is based on the popular Cherry Framework that allows the theme to provide sweat free customization, installation and content management. Among the plugins included with the theme is the Cherry Projects, which allow you to showcase your best works in an elegant gallery. Another great thing about Addison is its intuitive admin panel that will allow you to set layout types, animation effects and pagination mode. Aside from images, the extension also supports video and audio formats. This will allow you to engage your project viewers. 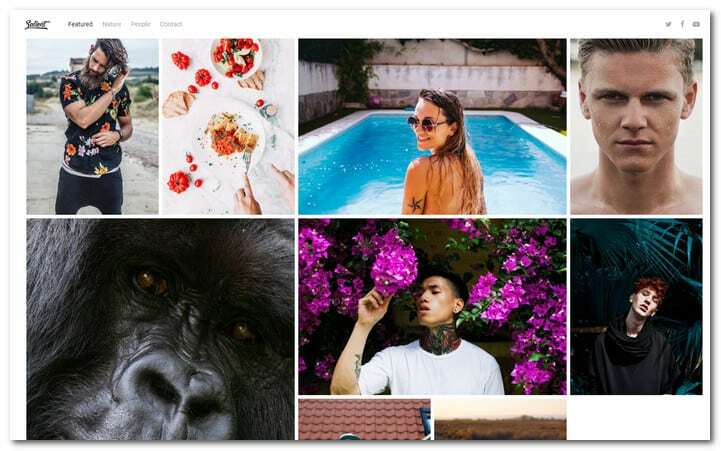 The theme features a photo grid that can be managed easily. With this feature, images can be displayed by tags or categories. To make your online portfolio style more personal, the Live Customizer plugin was integrated with the theme. Addison was created using Twitter Bootstrap 3 Framework. Salient has a lot of available demos that you can import with a single click. If you are an agency, photographer or anything that comes in between, the theme has all the things you need for a more prominent online presence. With this theme, you can have access to a number of exclusive sliders that were created and customized exclusively for Salient. You will have exclusive features like smooth parallax scrolling, amazing functionality as well as video or image backgrounds. On page transitions, there are multiple options available for a fluid and stunning user experience. If desired, you may turn these features off. 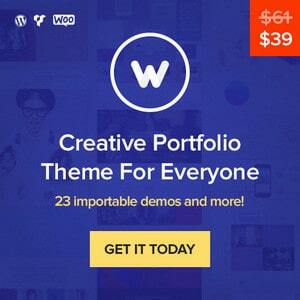 The theme also has one of the most complete sets of icons in ThemeForest. It has Steadysets, Linea, Font Awesome and Iconminds. If you so desire, you can create stunning parallax scene using Multi Layer Mouse Based Parallax. The parallax effect is animated with the movement of the mouse. This is a responsive and versatile WordPress theme that comes with contemporary creative layout for all kinds of creative website building. TheGem is a high performance theme that was developed and designed as the decisive web building toolbox filled with styles, features and design elements. This high performance theme is responsive and versatile. With this theme, you can build high performing websites in a matter of minutes without concerning yourself with codes. 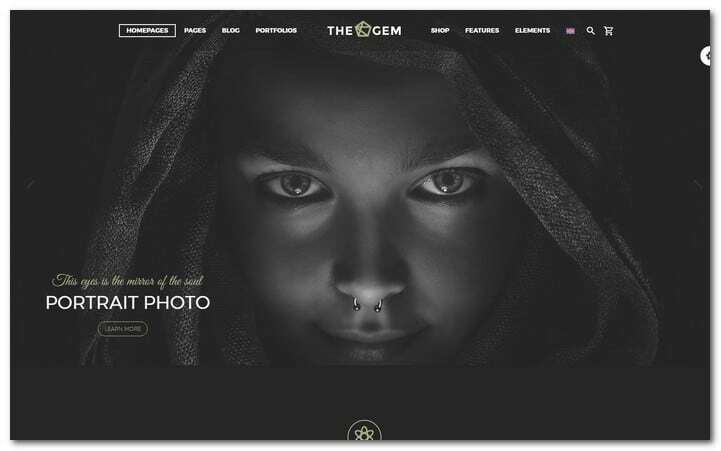 So forget about codes and let your creativity flow with TheGem WordPress theme. The theme comes with more than 40 unique design concepts that can be used for a variety of purposes. 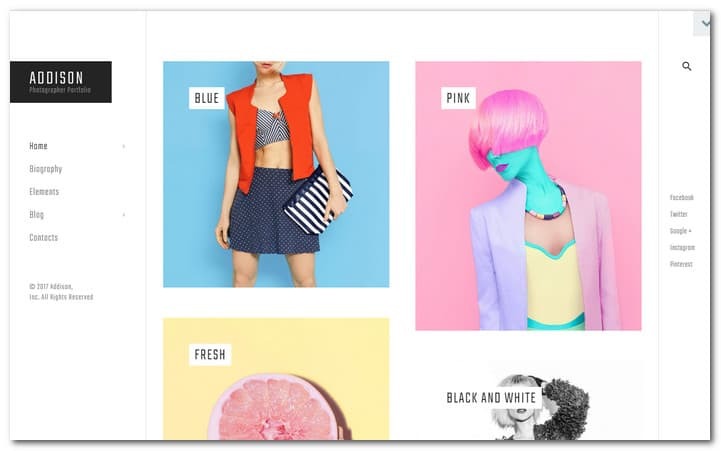 It has 150 beautiful demo pages, 8 navigation settings and flexible page layouts. With these features, the theme is perfect for corporate business, creative agency, freelancer, architect, digital artist and photography website. 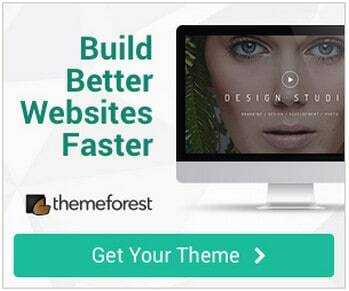 This theme will take your website to the next level. You can customize everything in The Ark. You can change margins, paddings, backgrounds and customize CSS and JS codes for all breakpoints. 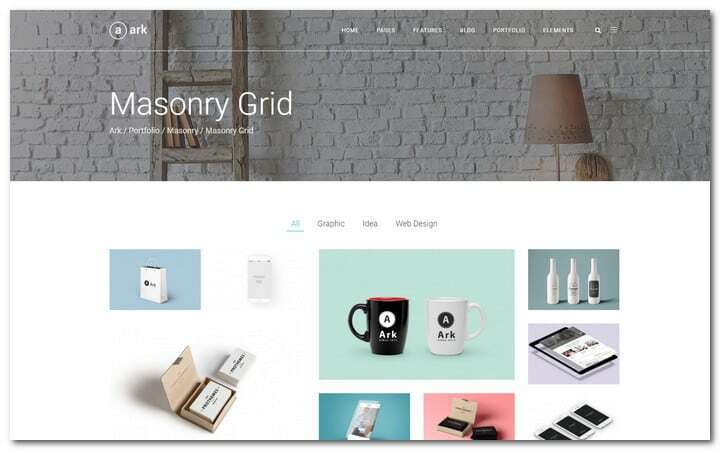 The them is ideal for barber, company, fitness center, restaurant, chapel, café, photography, photographer, star portfolio, bistro, WooCommerce, fasion, dentist, attorney, medical, treatment center, mobile apps, scientist food market and freelancer website. All aspects of the theme can be customized easily. These include the headers, title bars, blog, blog archives, footers, portfolio archives, profile, search and others. Every element of The Ark comes with CSS styles for light and dark text color. Customize with a single click or make use of advance options if needed. 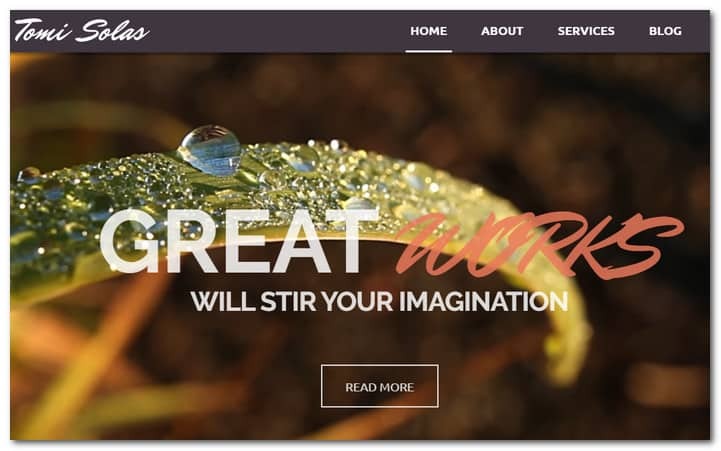 With this theme, you can create stunning full screen areas in your website. You can build impressive forms then customize and style them. And since the proper font is vital to your website appearance, more than 800 fonts have been incorporated with the theme for free. Hellomouse is a minimal and clean portfolio WordPress theme. With this theme, you can create a perfect first impression. If first impression counts, then the robust homepage of this theme will help feature your best work. To help your users concentrate on your content, the theme was made with minimal layout. Hellomouse is a truly responsive theme. It has been tested against real devices and browsers and found to be accessible by any device. There are over 60 available options included in the customizer so you will be able to customize everything in your website. To give you more functionality, custom widgets were also added. As if that is not enough, social networking has been added too as well as Flickr, Twitter and others. Hellomouse is optimized for SEO. With this theme, you will achieve better ranking in Google, Yahoo!, Bing and other leading search engines. This theme is perfect for professional photographers. It has all the things that a photographer will need – a clean and nice look, easy installation and easy to manage function. The theme allows easy addition of images and videos. The theme supports Cherry version 4.0 and is compatible with WordPress 4.2.X to 4.7.X. The theme features advanced theme options, sliced PSD, calendar, crossbrowser compatibility, custom page templates, dropdown menu, Favicon, Google Map, Google Web Fonts, social options, tabs, tooltips, tag cloud, parallax, HTML and JS, Bootstrap 3.3.X, CSS 3, HTML 5, jQuery, SASS, Monstroid, MotoPress editor, MotoPress Slider, responsive design, retina support, search engine friendly, blog, portfolio, accordion, Isotope, carousel, single column, audio player, video integration, contact form and Ecwid support and more. The theme is well documented. 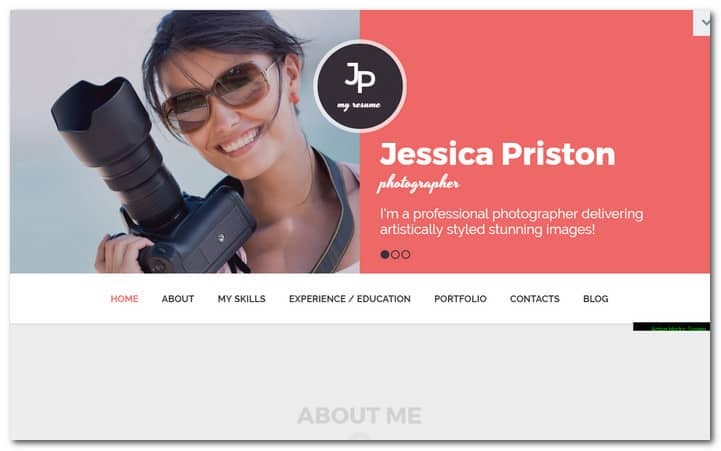 With WordPress template for a photographer portfolio, you can get the job you have been dreaming about quickly and easily. The design of this CV template is as modern as it is official; all the things that you need to have from a robust portfolio. The template has a minimal and clean design that makes sure your content captures the full attention of your viewers. This WordPress photographer template is a fully responsive design allowing your website to be viewed by more people from mobile devices. This template is well documented. It features advanced theme options, Sliced PSD, back to top button, calendar, crossbrowser compatibility, custom page templates, dropdown menu, Favicon, Google Map, social options, Google Web Fonts, tabs, cloud, tooltips, tag, HTML plus JS, parallax, Bootstrap 2.3.1, CSS 3, HTML 5, jQuery, LESS, admin panel, bootstrap, Cherry Framework, online chat, responsive design, search engine friendly WPML support, Ecwid support, blog, portfolio, accordion, carousel, Isotope and slider. The template was created for art and photography websites. Its transparent main menu bar looks very stylish. Ghost buttons and outlined icons impart light airy feel to the photographer WordPress theme’s layout. Slider features huge images that can be considered a photographer’s business card. Testimonials are supplied with photos. Polygon background makes this section noticeable. Portfolio has tabbed navigation. Each image can be enlarged by clicking on it. Recent news section is illustrated. Touch-friendly social media buttons are above the Google map. This is a contemporary layout that is made for online resume. It underlines the professionalism and aesthetic sense that are vital to a photographer. This template can be transformed into a CV of anyone that likes to have an online page that will work in his favor. It is a single page design but it is incorporated with education information, short bio, timeline and portfolio. The idea is to present the special skills of a person to make him or her a perfect candidate for a job. The features of this template include Cherry Framework 3.1.5, advanced theme options, back to top button, sliced PSD, custom page templates, calendar, crossbrowser compatibility, dropdown menu, Favicon, Google Map, Google Web Fonts, tabs, social options, tag cloud, tooltips, HTML plus JS, responsive design, CV, search engine optimization, WPML support Ecwid support, blog, resume, portfolio, accordion, Isotope, slider and carousel. This template requires some software. These include Adobe Photoshop CS+, ZIP unarchiver, Apache Server and WordPress 3.9.x. The template comes with round the clock support all days of the week. It also includes stock photos. Satisfaction is guaranteed for this template. Focussity comes with the drag and drop page builder from Template Monster. With this tool, you can create pages easily even if you do not know a single line of code. You can make use of more than 25 modules, drag and drop functionality and a library of presets. The template also has an advanced set of configuration options that you can use to customize your theme design. 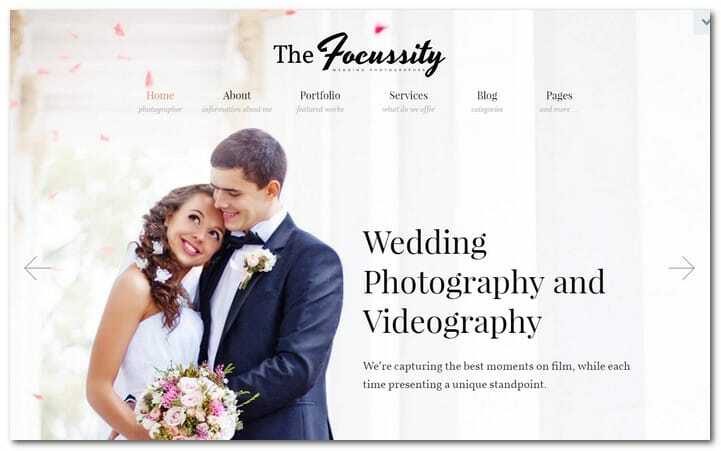 If you want a wedding WordPress photographer theme for WordPress that will attract customers, this is the template for you. It will highlight your best work instantly in a single scroll and take your visitors to a booking form that can be found on the same page. You can place your information right in the middle of the design allowing visitors to find them easily. You can name the awards you gathered as a photographer and utilize elegant thing pointers of image slider to click through the images. The template has a responsive design so your website will look good on all screen sizes. 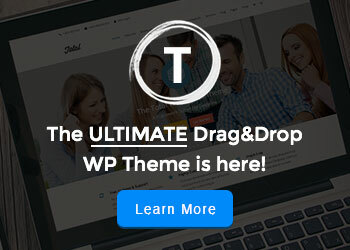 This template features advanced theme options, back to top button, calendar, commenting system, crossbrowser compatibility, dropdown menu, Favicon, Google Map, Google Web Fonts, live search, sample content, social options, MailChimp ready template, Twitter Feed, drag and drop content and many more. 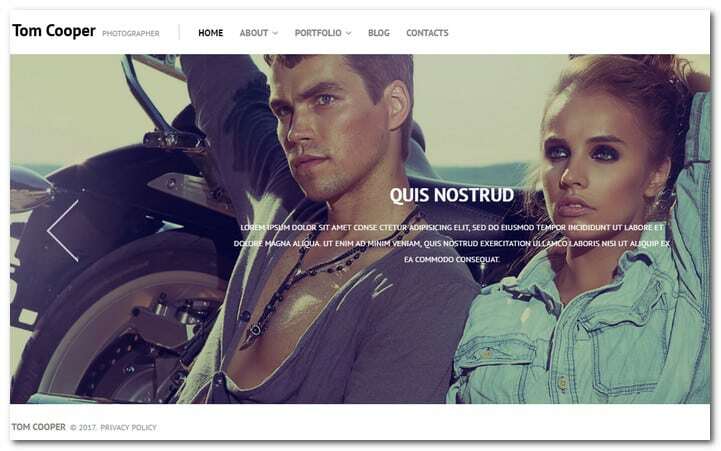 This is a cleanly designed photography WP template that comes with a full screen slider. It has a professional and ultra modern design with content oriented design that is optimized for photography sites. You can customize this template easily for personal resource, gallery or a photographer or model portfolio. A Check Available Booking Dates form is available at the bottom of the page. This helps in saving customer time. This template is created on top of the Cherry 5 framework. It utilizes all the flexibility and power of Bootstrap 4 framework so it is ideal even for web design newbies. In addition, the template also has a Live Customizer that will show you your theme customizations immediately. This theme is friendly to SEO, thereby providing your site with better search engine ranking. Full documentation comes with the theme package so there is no need to think about potential issues with the theme customization and installation. 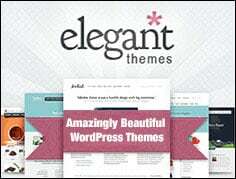 The theme is compatible with WordPress 4.2.x to 4.7.x and WordPress engine 4. 6.x. It features a calendar, commenting system, crossbrowser compatibility, social options, Google Web Fonts, dropdown menu, Favicon, Google Maps, social options, sample content, MailChimp ready template, background options and much more. 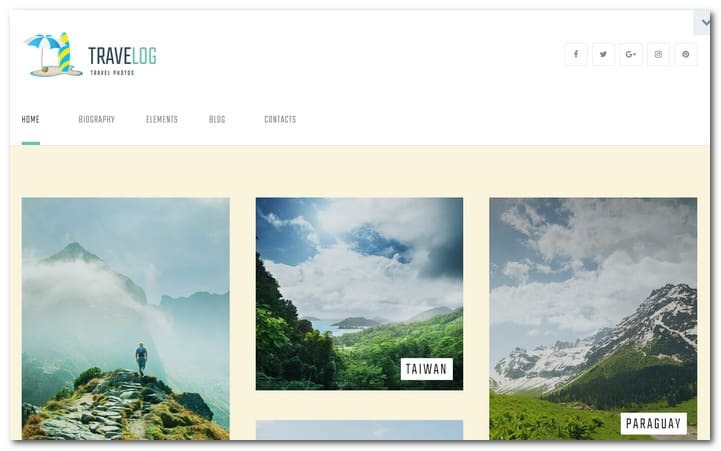 Travelog is a travel blog theme for WordPress that has a minimal and responsive design. It comes with a wide range of additional functions and a clean grid homepage design. With its photo gallery extension you can build a photo album online that features your resorts and tours quickly. 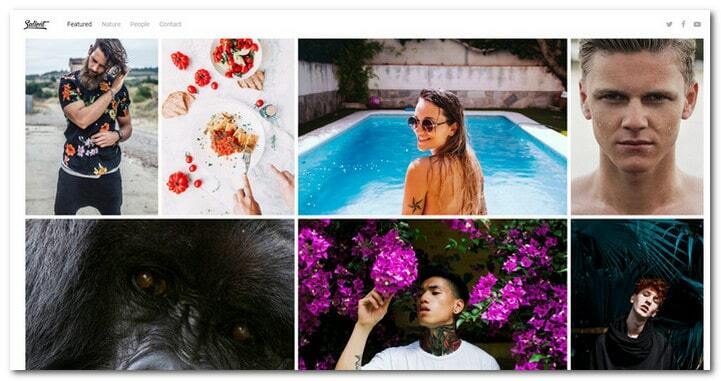 Travelog also has a comprehensive collection of photo sharing buttons, which will allow you to include Pinterest, Instagram and other social networks quickly. The theme is powered by Cherry Framework 5. Live Customizer was used to provide intuitive website management and more flexibility. The features of this theme include advanced theme options, back to top button, commenting system, crossbrowser compatibility, full documentation, sample content, Google Web Fonts, Favicon, social options, tag cloud, full documentation, CSS 3, HTML 5, SASS, jQuery, blog, retina support, WPML support, Carousel, slider, video integration, audio player and more. Please visit the demo page by clicking on the link above for more info. We hope you found this article helpful and maybe even picked one of the templates down below for own use. 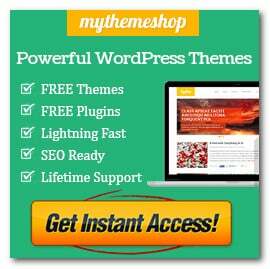 Click this link if you want to see more photo WordPress themes. It will lead you to the whole stock of the relevant themes on TemplateMonster.com. Also please leave a comment and let us know what you think. Very helpful Post Thanks Admin sir. All the Themes are very unique & imaginative Photography Blogs. U guess I need to put this on my list it looks perfect for my Business. Thanks for such a nice sharing information. hmm I want to try this travel themes thanks! Thumps UP!